Teacher strikes and walk outs across the country are again making news. Last year West Virginia, Arizona, Oklahoma, and Colorado made news for their teacher walk outs. Los Angeles teachers are currently on strike and right here in Colorado, Denver Public Schools is also a possibility. Chalkbeat presented some interesting coverage about Denver pay disparities and how much administration Denver has compared to other districts. Read the full article below! We’ve included just a few sample quotes below. It also doesn’t serve students well to assume that district administrators “do nothing” or are not as valuable as other staff members. Pitting teachers and classified staff against district staff isn’t productive and actually causes us all more grief during elections when we need community support the most. Yet in the case of DPS, the numbers do reflect an issue of priority, particularly when the numbers are not in alignment with the rest of the state. While we are intently watching what happens with Denver, we have to wonder how we will solve this issue on a statewide level. With Amendment 73 a loss (just missing by approximately 200,000 votes) and no new funding, the overall issue still isn’t being addressed. Denver has a problem but other districts do as well. What might happen in Jeffco during upcoming negotiations? Edited on 1/21 due to the $3,000,000 that will go to charters. Also, keep in mind these are not complete or factual numbers, just a quick calculation to show $33,000,000 doesn’t go far. That means we have $15,000,000 for staff salaries. Approximately 14,000 staff members, less approximately 100 district administrators who were exempt from salary increases based on the promise to the community in the mill levy. Even if the money were divided equally amongst staff (it likely won’t be), that’s $1071 per employee per year BEFORE taxes or a less over $89 per month BEFORE taxes. It’s a positive boost but it won’t make our salaries truly competitive. This was a comparison of salaries before the election (other districts also passed mills and bonds); negotiations in Jeffco begin next week. 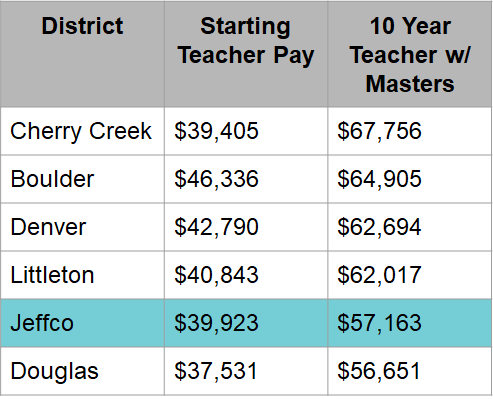 Complicating matters more for Colorado education staff is the higher cost of living in the metro area. Some districts and other governmental authorities have proposed building low cost housing, an interesting idea but one should also think “do you want your employer to also be your landlord?” Is it an appropriate role of governmental authorities to be in a position of housing developer/provider? For Denver, further complicating matters is an issue of “bonuses.” The bonus structure for “good teachers” is floated at the Capitol every year during the legislative session and has failed each time. Teacher associations are also generally opposed to them. Bonus structures in Denver, also known as “Distinguished” ratings bonus, are highly controversial, often pitting groups against one another. One Denver teacher explained that one the schools “improve,” the bonuses go away, thus eliminating the incentive. Another noted in an online conversation the issues of inequity, “ProComp, merit pay systems put a monetary value on teaching children of color, poor students, and English Language Learners, and perpetuates the exact deficient based practices and implicit bias that holds these kids back from equity in our public education system.” Most Denver teachers advocate that as professionals, their intention to serve their students is the same regardless of what students are in their classroom. “How about supportive leadership, coaching, more mental health support, co-teaching models, more plan time and smaller class sizes? You know, the things research says work and the things teachers ask for in every survey on this issue,” wrote one teacher in response to the bonus/merit pay conversation. Regardless of opinions as to what should happen in DPS, all districts in Colorado have these ongoing issues. Because we have staff receiving public assistance due to low wages (which, by the way, is more expensive to taxpayers than actually adequately funding salaries to begin with), we will be watching both Denver and Jeffco and we hope you will as well. Our education staff members do deserve equitable and adequate compensation and recognition for the valuable work they do. Previous PostGraduation Rates Continue to IncreaseNext PostWhy is Full Day Kindergarten A Concern?